A NOTE FROM KEVIN NEALON. This weekend I got the shock and surprise of my life! I was going through my emails looking for a phone number when I came across an unopened email dated November 14! It was from my new friend Kevin Nealon, from Saturday Night Live, who I had just met the night before. I have no idea how I missed this very important email but I guess it was because I was traveling and wasn’t able to check email till I got back home. Anyway, here is the very nice email that Kevin wrote plus the photos he sent. flattered that you guys came to my show. Oh, loved your website, too!! are making! Please keep us updated on the foundation. Most of you have seen the photos from my trip to Manhattan Beach California, when I went to visit my friend, Scott. Well, on the visit, Scott suggested we go see Kevin Nealon at the Comedy club. That is where it all happened. After the show Kevin came over to meet me. It was there when I shared with Kevin and his Wife Susan about NF. What a nice couple they both are. So kind and understanding to NF, and the JUST ASK campaign. I’m proud that Kevin is wearing one of my JUST ASK! T-shirts. You never know where you may see one next. Thank you Kevin and Susan for your support. Hope to see you soon. Wow! Tonight I was invited to the Rodeo once again. It was a more then Terrific night. The music was the best I’ve heard so far. Clay Walker sang all of my favorite songs and encouraged everyone to join in. Pretty cool. It was cool to see him ride a horse to the stage. A real Texan. A big thank you to Laurie Selzer, from MNI (Media Networks Inc) for allowing me to join them in the Verizon West VIP suite. The food was terrific. I wish I knew everyones name I would love to say thank you for the wonderful treatment. Here are a bunch of photos I took tonight. I hope to add everyone’s names to these when Lou gets them from Laurie! Tonight was another great night at the Houston Livestock Show and Rodeo! I started out with the live stock show and all of the other fun things. Oh, my God! Did I enjoy the FOOD. Everything was to die for. Deep fried Oreos, steak burgers, foot-long sausage sandwiches, giant cinnamon rolls with lots of icing. 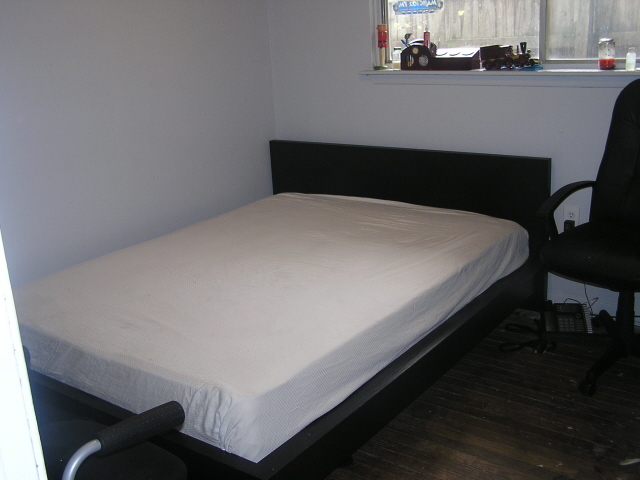 But don’t take my word for it, check out the photos for yourself. Click here to see photos from today! 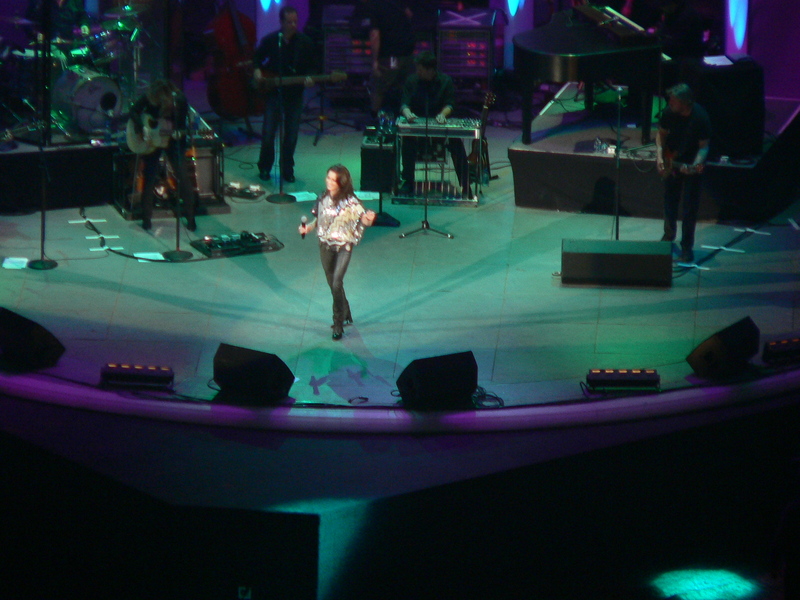 I went to the Rodeo to see Martina McBride. She was great and the music was terrific! She really sang her heart out. She sang all of her best songs and the crowd loved it. Of course, so did I. Martina loves Houston and she looks forward to her show here every year. I know why she loves Houston. I feel it every time I go out. So many people here have been so kind to me. I’m thankful to be in a great city like Houston. It made me feel so good when people I never met came up to be today and spoke kind words to me. You will see them in my photos. People like that are heroes to me! Houston, It’s almost time to Rodeo! Cowboy Up, America! When a cowboy’s in a pinch, he just tightens up the cinch, spurs his horse and rides right through it, cause that’s the way the Duke would do it. He’d Cowboy Up. 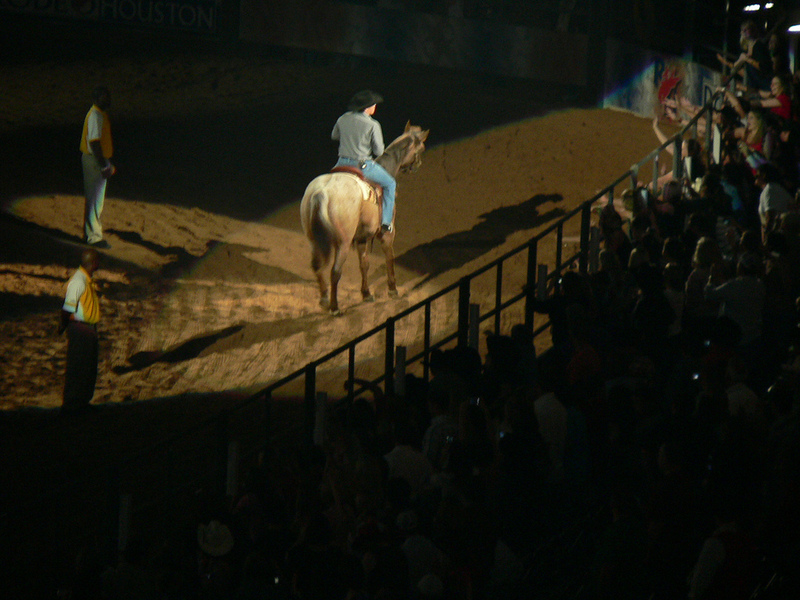 This year it’s going to be another terrific year for the Houston Livestock Show and Rodeo. Just as I did last year, I will be there enjoying all activities for the 2008 show. This year I plan to see more of the livestock show then I did last year. As for music, there are several performers I want to see this year. There are two I have in mind now, that I want to see Rascal Flatts and Tim McGraw I will see more then one, I hope. All that to look forward too, and I haven’t even started on the great food. 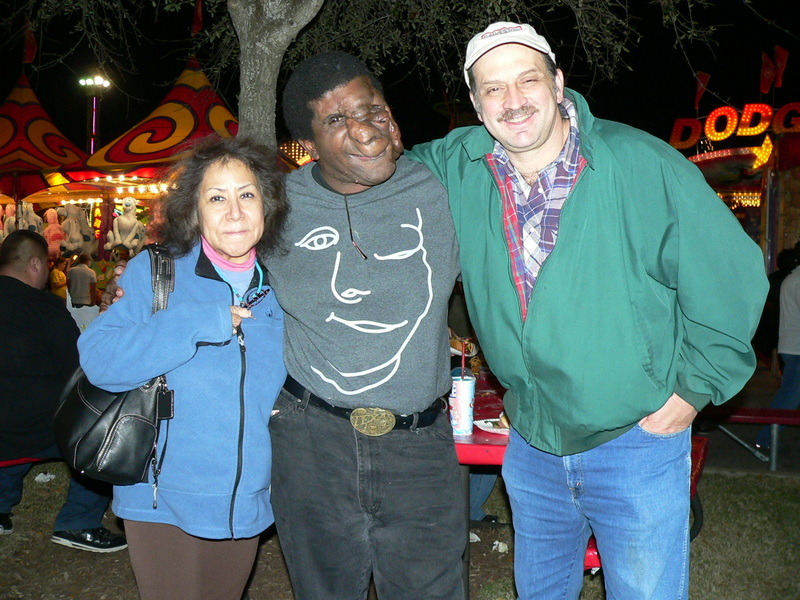 How many of you are planning to go the the Rodeo, and who will you see? It would be a great idea if any of you go, to take pictures and send me a photo and I will make a section for our photos for this year on the blog and Flickr. 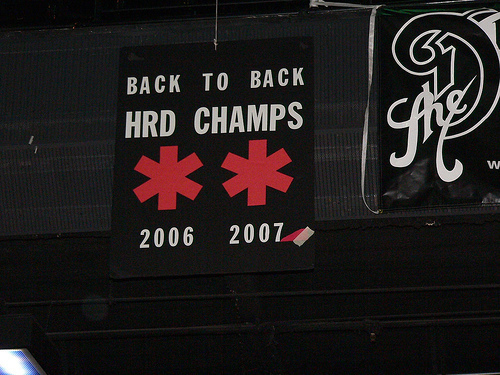 Psych Ward Sirens Win Houston Roller Derby Championship!!! Last night, Lou and I went to the Verizon Theater to watch our favorite sport, Houston Roller Derby, and I gotta tell you, it was incredible!!! We saw some of the most intense skating we have ever seen. All the skaters were pumped up and ready to leave it all out on the track. Mistilla the Killa was a woman possessed!!! In the second half near the end when the score was almost tied, she broke the game wide open with an incredible jam that put the Bosses away for good. Dementia was the last jammer of the evening and sewed up the win for the Sirens with a perfect jam!!! 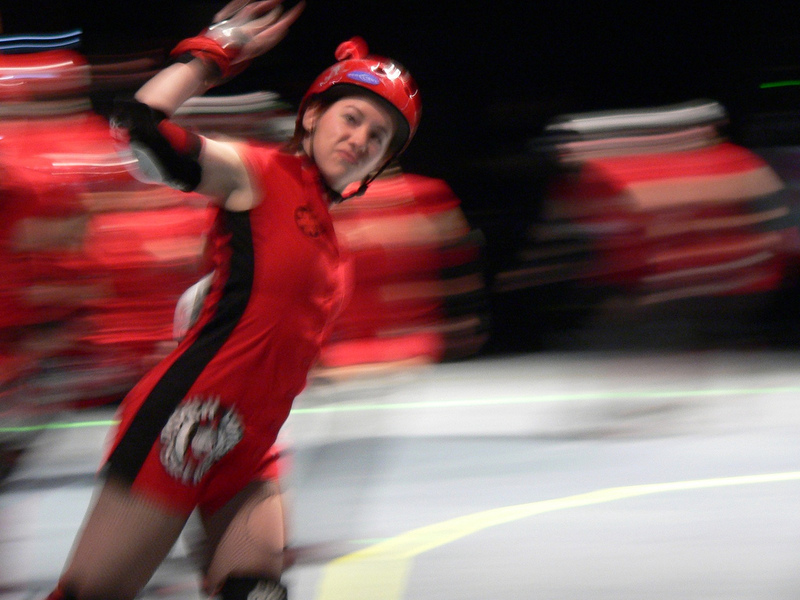 If you haven’t experienced Houston Roller Derby yet, you don’t know what you’re missing. Last night was the last match for this season so you’ll probably need to wait till next year when the league starts again. I know I can’t wait!!! 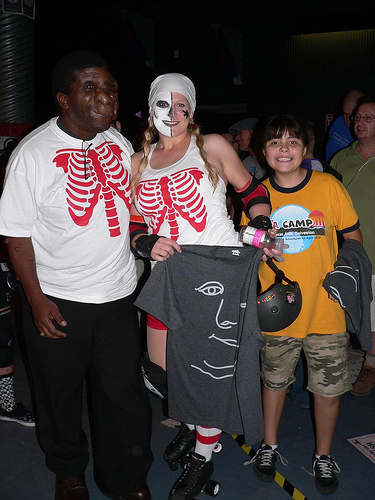 THE HOUSTON ROLLER DERBY ROCKED LAST NIGHT!!!! 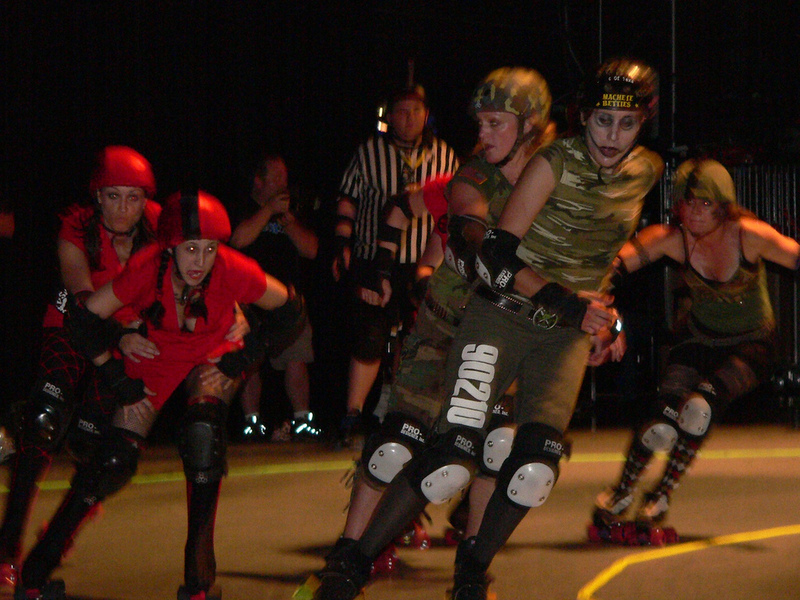 Last night’s Houston Roller Derby action was the best I have ever seen. Lou and I were close to the action on the floor and almost had a couple ladies land in our lap. Maybe we’ll be luckier next time! All of the teams did a terrific job. I had no idea how much talent and physical strength you need to be a skater until we sat up close. 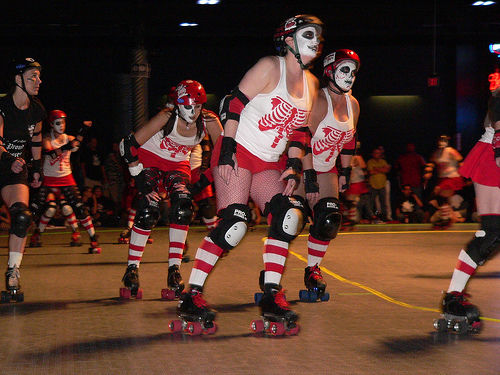 You can see all the action that’s going on, not just what the jammer is doing. SEE PHOTOS OF LAST NIGHT HERE! I saw Beverly Kills throw a block on one skater that I felt this morning! What I really like about Houston Roller Derby is that the skaters will come up to you and talk to you and thank you for coming! The famous skaters Dementia, Mistilla the killa and Jekyl & Heidi (they’re all famous in my head) were very nice to me and took lots of photos with me. 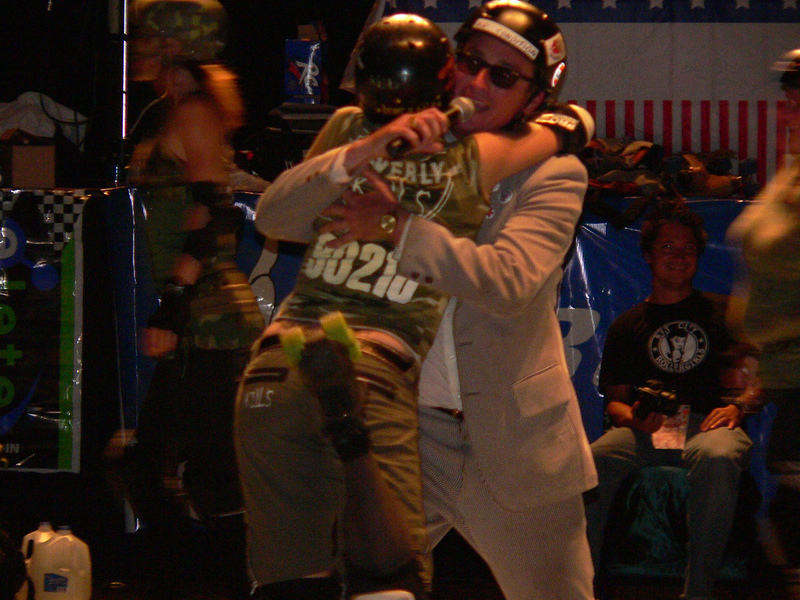 The roller derby ladies make me feel like they are my fan, just as much as I am a fan to them. If you want to feel like you have a fan, all you have to do is go to one game. You will be hooked. Believe me you will enjoy the game. I always enjoy myself. IMPORTANT NOTE: The Colonel is crazy!!! 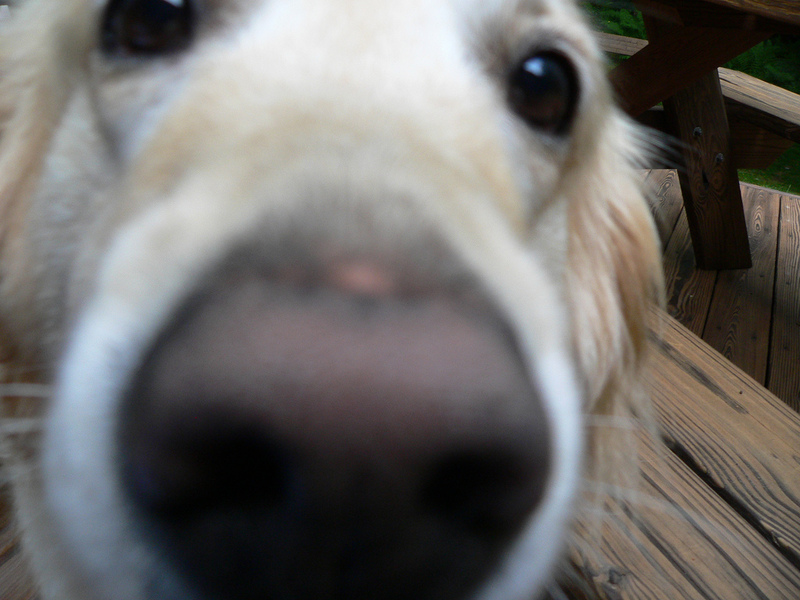 I learned how to use a digital camera, sort of. Stay tuned for photos to be posted at your favorite Flickr site, or Reggie’s! I missed you guys…in a perverse sort of way! I received a wonderful letter from my friend from years back. 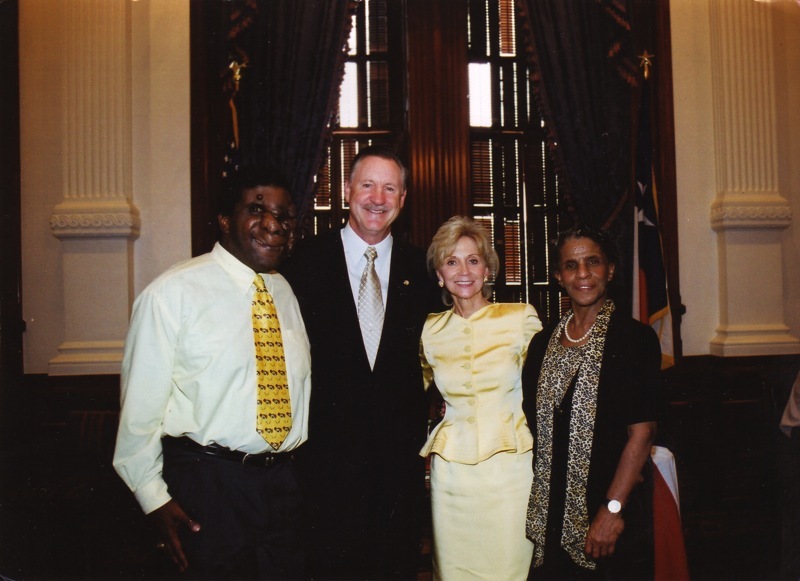 At the time I met Mike Moncrief, he was Senator Mike Moncrief for the State of Texas. 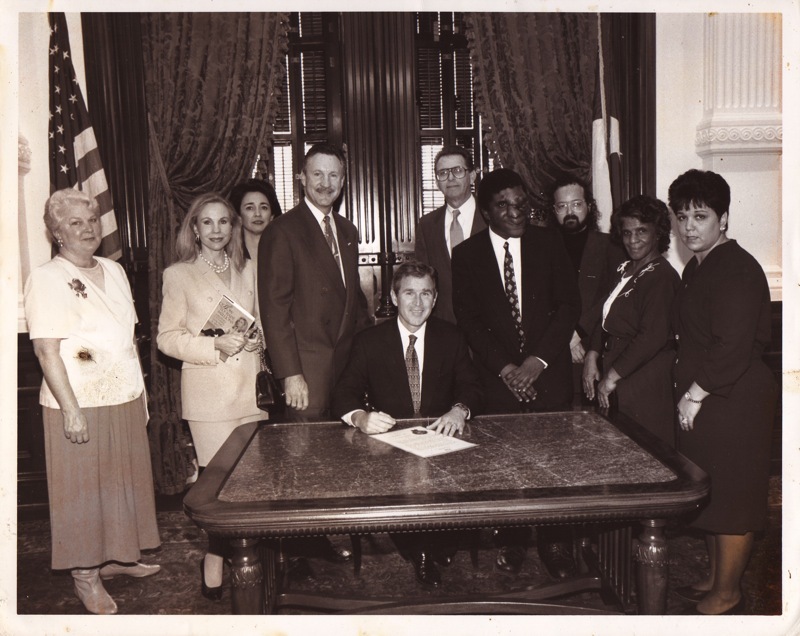 And now he is Mayor Mike Moncrief of Fort Worth. He and his wife Rosie have been very supportive in everything I have been involved in. You will see that in the photos in my picture section on Flickr. Mike and Rosie also wear one of my JUST ASK t-shirts. I’m honored to call them my friends! challenge of raising awareness of NF and search for a cure is made easier by your efforts. By the way, I wear my Tshirt every chance I get and have had numerous folk come up to me and ask about it. Keep up the great work and you are more than welcome to post this email on your blog. Hello Friends We are coming up to another day of celebration. 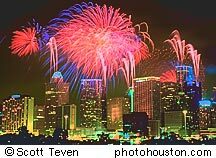 Wednesday July 4th Houston is having a day of fun, music and a large display of fireworks. Come join the fun! 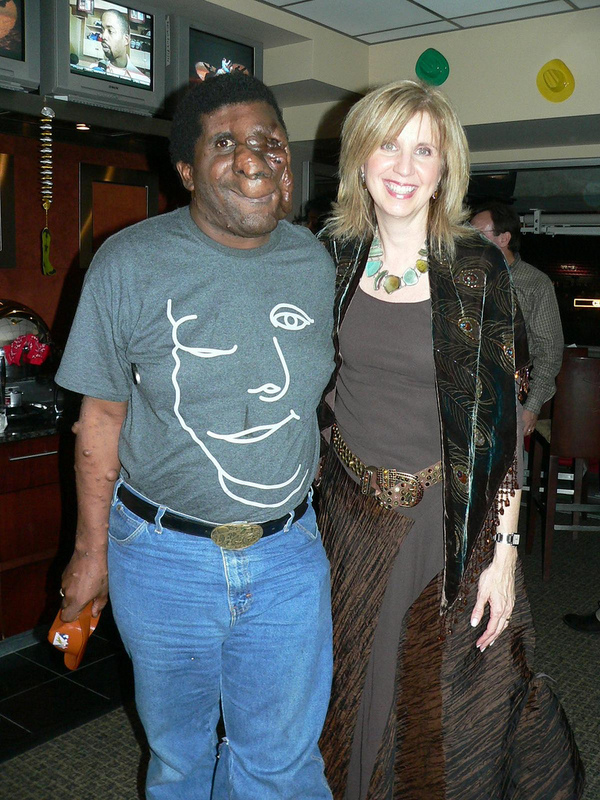 I plan to be there wearing my JUST ASK t-shirt and would be happy to meet new friends. I always get a little nervous at these large events, but I’m sure with the great people we have in our great city, I will have a TREMENDOUS time. I hope to get some pictures meeting more friends. See you there. I call this phase 1. There is bad news and good news. There was a small fire in my room. The good news is that my computer was not damaged. The pictures I have posted are the begianning of the repairs. Believe it or not, but this is a major improvement. The green wall is gone. The hole in the wall is repaired. 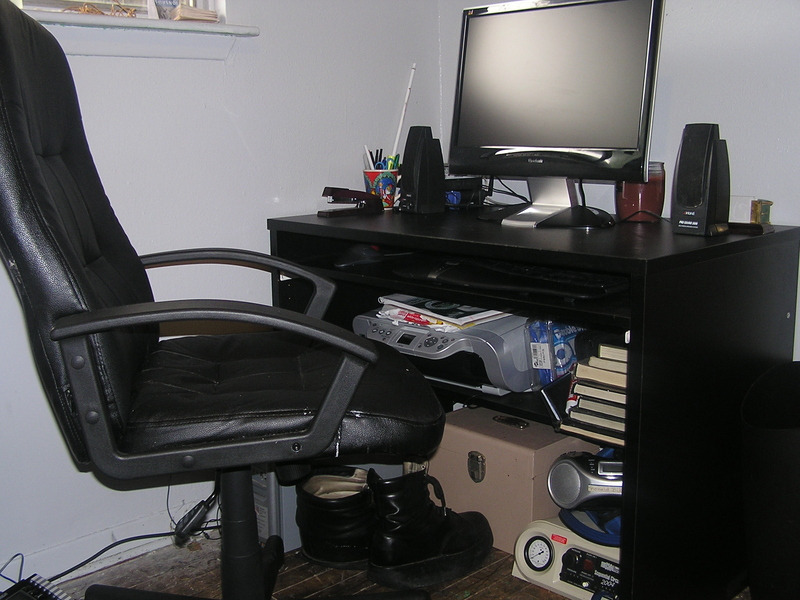 I have a new desk, or work area. I have plenty of room which I did not have before. A lot has been done, and still more improvements are to come. Stay tuned for the finish project. This makes it a lot easer to do my web-site posting and flickr post. Today I was invited to join members from the Texas NF Foundation and doctors from MD ANDERSON HOSPITAL for a special presentation. 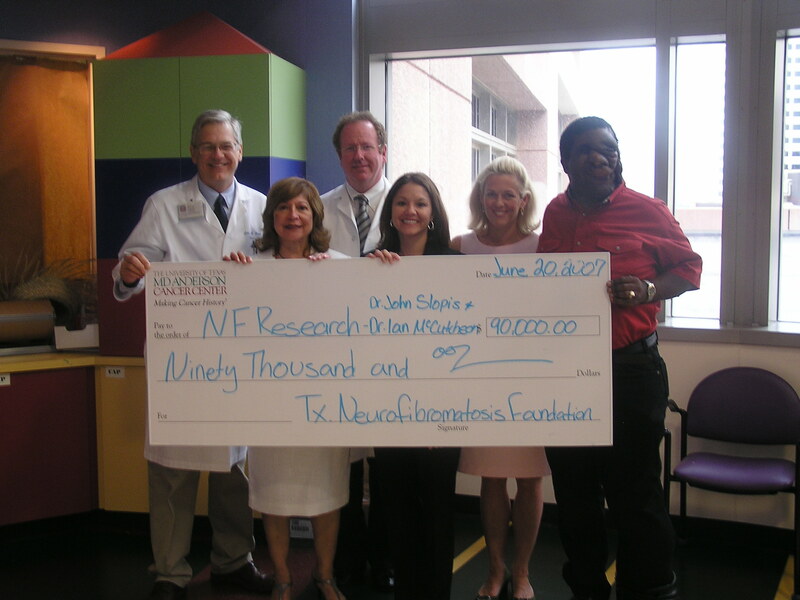 Minerva Terrill, a board member of the Texas NF Foundation, presented a check for $90,000 to the hospital for NF research. This is something all of us who are affected with NF can be very excited about. Great researchers and clinicians are out there looking for a cure and there are great people like Minerva and Cindy Hahn who are doing what they can to raise the funds needed to fund that research. We have a lot to look forward to. Stay tuned! I know more good news is ahead. People are beginning to JUST ASK! This is GREAT! Friday night my family and I went to one of our favorite restaurants. Taste Of Texas. We had the best time I can remember. It was 15 of us. Sisters, nieces, nephews, brother sister in-law,and Mom. Of course ME ME ME! 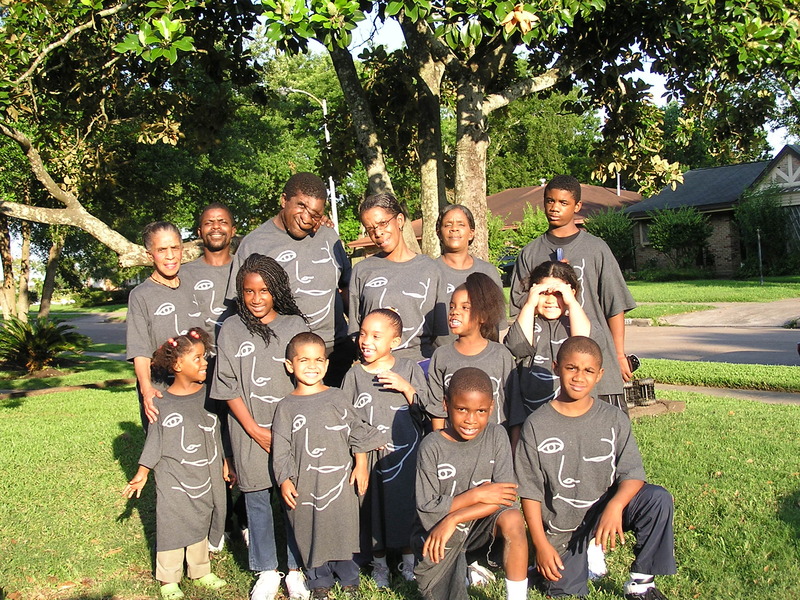 We all sported out JUST ASK t-shirts. We felt like stars. We got a lot of smiles and people commenting on our t-shirts. Lots of you ASKED. I thank all of you that wanted to know. It was a wonderful family night for us. Thanks to the Staff of The Taste Of Texas. You did a TREMENDOUS job as always! Most of you who know me, know I love baking and preparing large meals for my family relatives and friends. Sunday’s are always fun. 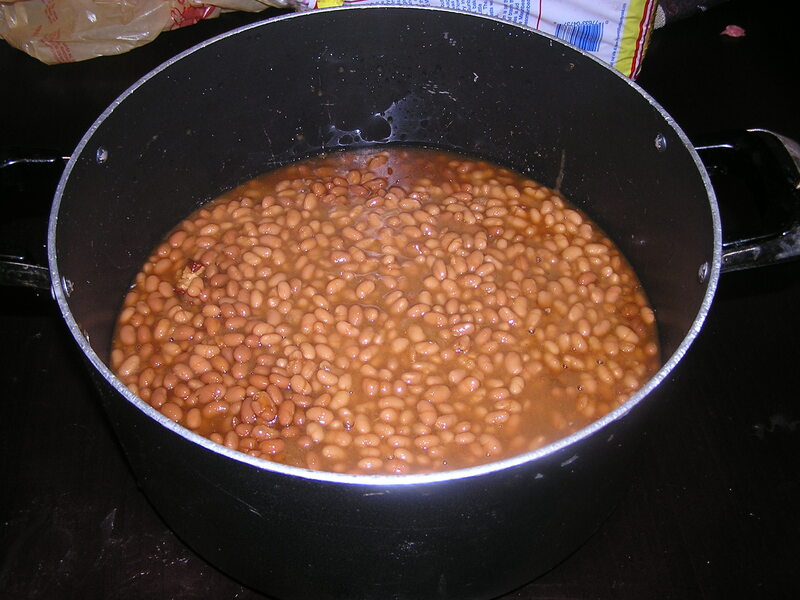 That is the day the largest meal is prepared. Yesterday was a nice meal, and I would like to share some photos with you. 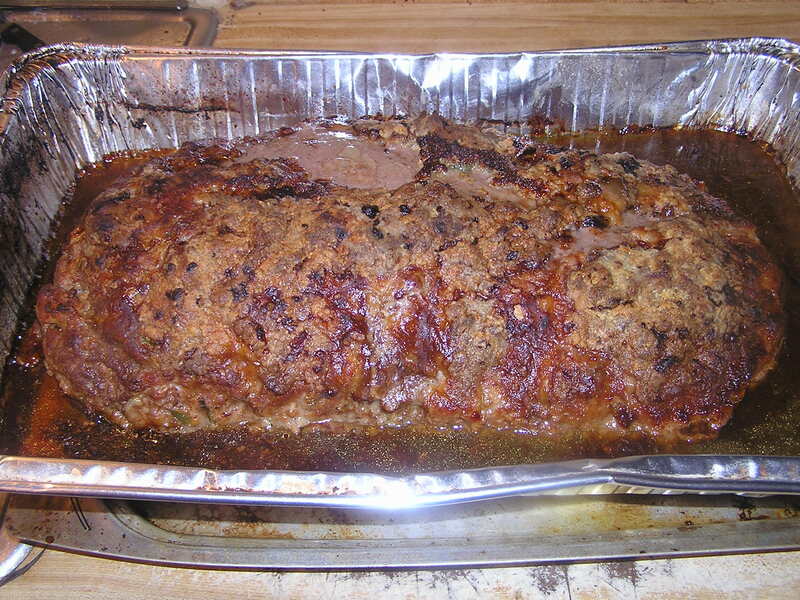 Now this wasn’t the best meal, but we all enjoyed it and are very thankful that God provides for all of us It you have some photos of what you enjoy cooking, grilling, or baking share your your photos and comments. And if you have tips that would be terrific. I know I can use all the tips I can get. Looking forward to your comments. My favorite cake to bake is German Chocolate Cake. And Cobbler. Peach and Berry cobbler. You will get to see photos of that soon. I would love to love to see your photots. Ottmar Liebert is one of the best flamenco guitar performers around. A friend of mine, Greg Gorman, made it possible for me to be to at one of Ottmar’s performances at Rockerfeller’s in Houston. Mom and I had a terrific time. After the performance Ottmar was nice enough to take time to talk with me and take photos. He even signed one of his CD’s for me. If you like the flamenco guitar or New Age type music, you will enjoy Ottmar’s music. 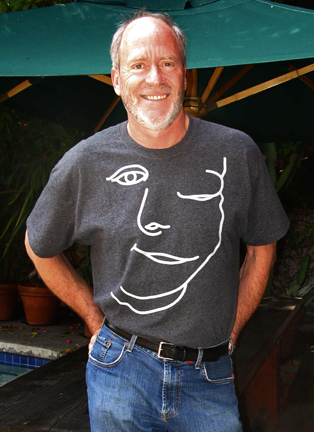 I have a link to his site as well as my friend Greg Gorman. I am happy to call both of them my friends. Maybe you have pictures from camp you want to share. Or maybe a support group. I hope to see your photos soon. Lou and I went to the Art Car Parade yesterday and met some crazy, wonderful people including the legendary George Clinton, Mayor Bill White, The Roller Derby Girls and Wednesday, my favorite day of the week and belly dancer! We took photos of the coolest cars and people we came across during the Art Car Parade. Environmental EncroachmentRules! Lot’s of really fine cars but they couldn’t hold a candle to all of the people we met and took photos with! Hope you enjo and to all of you who we met this weekend, thank you for making it such a wonderful experience! CLICK THIS TO SEE MORE! 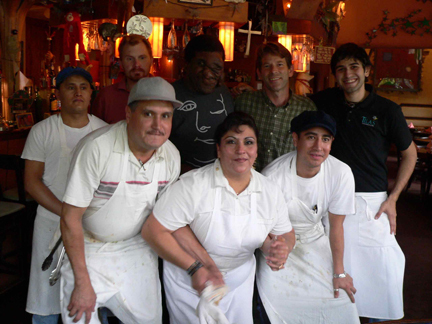 My favorite Mexican Restaurant – Tila’s Restaurante and Bar on South Shepherd in River Oaks! Arthur Meyerson, Lou Congelio and I stopped at Tila’s on Friday for lunch and had one of the most incredible meals know to man or woman. The service was great and we were made to feel very special. Thank you all! HEROES AT STATION #59 ON SOUTH POST OAK! 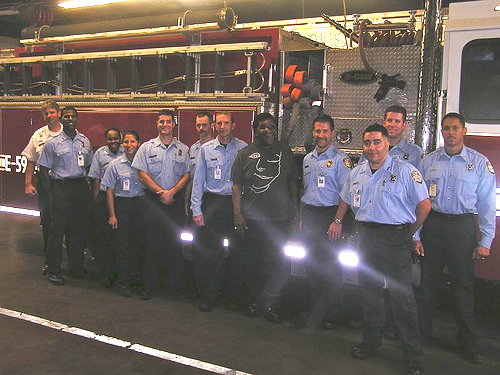 I just got home from visiting my friends at Fire Station #59 on 13925 S. Post Oak at Prudence, in Houston! All I can say is wow! It was TERRIFIC!! The men and women at Station 59 really helped my family out during my brother Ronnie’s illness and I am so appreciative of the help and compassion they provided! Just know that you are never alone when you have incredible people like these guys just a phone call away!!! God bless you, all of you!!! 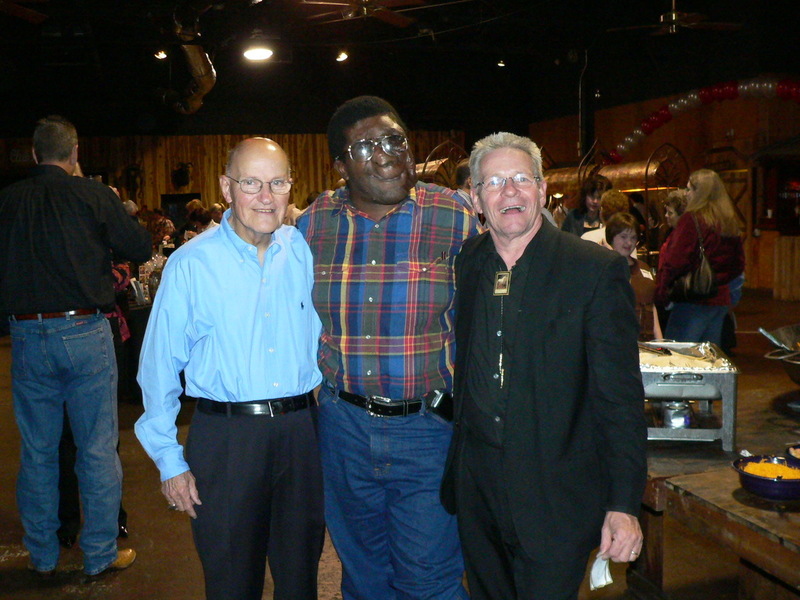 GREG GORMAN – World famous photographer, great supporter of Reggie Bibbs and one hell of a nice guy!!! Meet my friend Greg Gorman. I have been friends with Greg for 20 years. I met Greg through Carolyn Farb when Greg came to do a special exhibition in Galveston. Greg is a world famous photographer who shoots a lot of celebrities like John Waters, Alfred Hitchcock, Jimi Hendrix, Jim Morrisson, Janis Joplin, Robert De Niro, Johhny Depp, Beyonce, Sharon Stone, David Bowie, Sophia Loren, Marlon Brando and Reggie Bibbs. 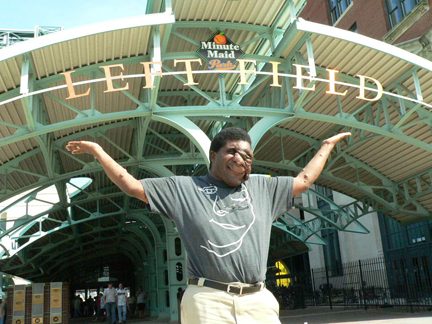 Reggie Bibbs First Ever Astros Game!!! Photos Now Online!!! CLICK HERE TO VIEW ALL THE PHOTOS!!! 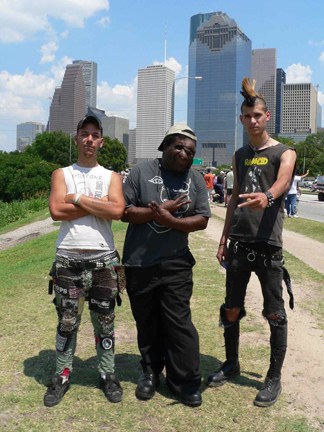 Houstonians and anyone who has visit our city. I’am looking for great places for photographing. If you know of areas around Houston, post them. I know we have many areas that would be terrific to photograph. I have in mind are places for a picnic, parks and areas that look nice in the spring. Please post. These photos of me were shot by my friend, Kevin Lynch. I met him when he worked for Greg Gorman. He works for him self now. I stayed at his house in Malibu. We went to Malibu and took the photos there. It was after they had that big fire years ago. 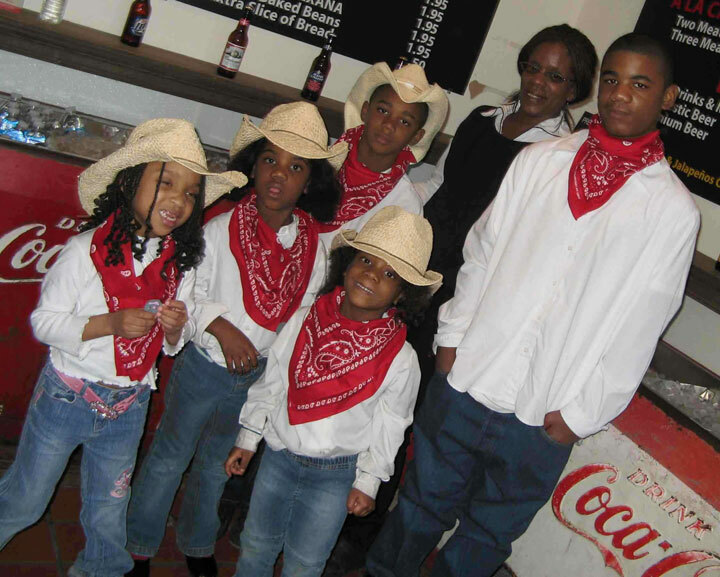 WESTERN ATTIRE ALL YEAR ROUND ? Today I went to Cavender’s www.cavenders.com to buy Western gear. I always shop at the S. loop store # 23. I love that particular store. I bought a nice looking belt. Want to be ready just in case I get to go to the Rodeo, or I have the opportunity to meet ASLEEP AT THE WHEEL. If not, I will have the western clothing for “Go Western” day at our Church Sunday. Reggie Meets Kevin and Susan Nealon in LA!